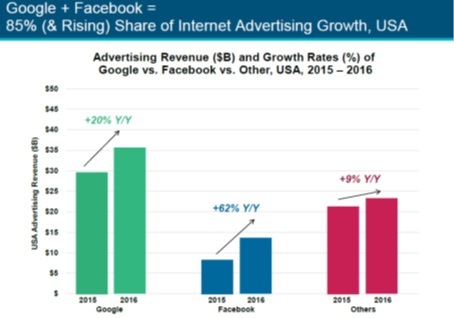 This broad trend of advertising shifting to Google & Facebook was reflected in Mary Meeker’s 2017 Internet Trends – where she clearly illustrated that growth in online advertising in US is largely being driven by Google & Facebook. And multiple machine learning algorithms that is optimizing the campaigns in Google & Facebook networks serves as a very effective moat against any new player entering the space. And Google & Facebook are expected to further deepen their moat – by artificial intelligence and machine learning. My bet is that in a 3-4 year time frame, >80% of the online advertising spends would be done through Google & Facebook platforms only. But as marketers, should we be worried about Google & Facebook Advertising Dominance? We all remember how Facebook killed the organic traffic for brands inside its closed network. The day Google also faces similar challenges with revenue creation – we can expect it to do the same. If the history shares any trends, a category that was dominated by one or two players – will result in poor services and higher costs for the customers. Interesting Times for a Digital Marketer. While we all appreciate the bravado of Snap Deal founders terminating all merger/buy-out talks and going ahead with an independent path, my two cents is that Snapdeal would find itself in this same place in another few months and waiting for a white knight to buy it or close-down the business operations. This is because the biggest challenge facing Snapdeal today is not competition or the business model. But the business momentum lost by Snapdeal– post its lay-offs and merger talks with Flipkart. It has lost significant talent, resources, word of mouth – during this period. In business, when there is momentum, everything seems to happen, sales managers overachieve, marketing managers generate better return on investment, operations manager bring better efficiency with higher customer satisfaction. Word-of-month and referrals are high. And employees in the business feel pro-active, whatever they touch becomes gold. In today’s world, the biggest challenge facing any business is either sustaining the momentum with better products, better offers (e.g. Apple) or bringing the lost momentum back to the business (e.g. Microsoft). And the leadership at organizations generally undervalues the impact of momentum in the business. While the website traffic at Snapdeal (thanks to organic) – has not shown any major decline, business volume and consumer mindshare has taken a beating. Most importantly business momentum – w.r.t. actions and focus has been lost in the last few months. Regaining the momentum – requires either significant money or significant resources(people), both of which are not in abundance for Snapdeal. Personal blog post - written on the eve of the first birthday of my baby. First something you should never forget. You are a part of God's plan - Can say this with 100% confidence, because few days before your conception, we prayed for the first time, committing our baby & timing of the birth to God's plans & his will. So whenever you read this - Know this, You are a part of God's plan. Wherever you go, whatever you do, God is going to be always be with you. Your 10 months of pregnancy - went like a breeze to me [I am sure that Mommy has more experiences to share :)]. But we had decided to name you 'Sheryl Samuel' if you are a girl. But we felt that God has been graceful to our family - during the entire experience. So we named you Sheryl Grace Samuel. So do remember that our God is a graceful God. Right from the Minute, I held you in my hands, the love started. Right from changing your first nappy to seeing you sleep for the first, you felt a part of me. I should confess that I have never been as happy as seeing your first 'poop'. You were a darling right from day one. It is your gradual & incremental growth & change that i love you the most. Whatever you did 'new' it never surprised your daddy. I love the way you enjoy our walks. I love the way you are happy when i come back from office. I love the way you hug while sleeping. I love the way you know me - right on the day of your birth. I love the way we enjoyed our first vacation at Neemrana. I love the way you want to do everything your mommy & dad does. I love the fact that it is the simple things - rather than your expensive toys that excite you. I love the way you can keep yourself engaged with your own plays.. But still need an assuring look at your parent every few minutes. I love your energy. Most importantly, I loved how you changed me. 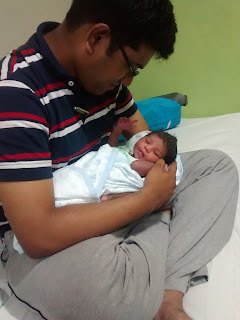 Thanks for the truly exhilararting ride as a 'dad'. Loving every day. Exhilarating also because there is mommy to take care of all my shortcomings and to take care of both of us - twice over. Tamil Student Movement - Why Now? Quite a lot of people on social networks don't understand the reason/timing of Tamil Student Protest Movement - after four years of the war. Writing this post to outline my thoughts on the same. To understand the current Tamil Student Protest Movement across arts, engineering, medical and law colleges, we need to look at the murder of Rajiv Gandhi. Thanks to this unforgivable act by LTTE, it lost the Tamils Support & TamilNadu Logisitcs Chain for the continued war. And the support for Eelam was always interpreted as support for LTTE in TN - the organization that killed a beloved Indian PM. That is why, the Tamils did not protest - even when the genocides organized killings were happening in Sri Lanka. Whatever your opinions are about Karunanidhi, everyone will agree on his street-smartness. Rather than being reactionary like Jayalalitha shutting down colleges after the protest started. Karunanidhi shut down all the colleges (arts, science, engineering, etc. ) even before the first whisper of protest happened. So the protest movement never had a chance to take root then. Worst of all, the media channels in India & newspapers continued to ditto the Srilankan army press releases - rather than finding out the real truth. But thanks to the growth of online media & rise of new Tamil Channels, Tamil people came to know the other side of the story. Over the last four years, a lot of key influencers in media & entertainment have been giving a lot of support, credibility to the entire Tamil Eelam movement. e.g. Dialogues in Aayutha Ezhuthu. This resulted in simmering Tamil Support for Srilankan Tamils - but not knowing what has to be done to show the support. So when US brought a resolution against Srilanka in UNHRC, it gave the movement a new meaning. So the Loyola Students first started the movement - followed by multiple colleges, giving a lot of credibility to the movement. While Vaiko & Co. would like to see the movement continuing, I expect it to fizzle out. Do expect the Congress(including Chidambaram) not to win even a single seat from Tamil Nadu in the upcoming Loksabha elections. Is Genocide Happening in Srilanka? London Olympics 2012 - that started off slowly and smoothly - reached a crescendo with the athletics event and finally finished with a bang yesterday. As an Indian, this was the first time I was looking forward to Olympics - primarily because of the various Indian Olympic Medal prospects - Deepika Kumari, Saina, Abhinav, Gagan, Paes + Sania, Sushil, Virender. I was convinced of the Indian support for the team at Olympics and also of the potential of the Olympic Participants. And they did not disappoint my faith in them. Among the qualified players for London Summer Olympics, some of them fell short of their potential on the 'D' Day and some of them brought their best performance to the table. But my biggest delight was seeing the unknown/unheard/unexpected like Gowda & Krishna Poonia qualifying for an Athletic finals (6th and 7th Indians to do so), Kashyap qualifying for Q/Fs, Yogeshwar Dutt's bronze, etc. Thank you all the Indian players, for making us proud in the last two weeks. After all the fighting and squabbling on the press, tennis players having the expected poor performance. And I am thankful & happy for all of them. But the biggest thanks should go to organizations like Olympic Gold Quest and Mittal Champions Trust. And I am sure that the team is thrilled to see their efforts in the last few years bearing fruit Hope these organizations (or similar organizations) don't lose sight - because of India's best ever Olympic Performance and Continue to find ways to support new & upcoming Indian athletes. But the biggest challenge for the Rio Olympics 2016 is whether a new set of athletes - who are inspired and buoyed by these 6 medals - will go and win 6 gold medals for India. Hope 1.2 Billion Indians receive their deserved haul of gold medals in Rio Olympics 2016. Bye & Thank You London! Here we come Rio! P.S: Seeing the Olympics also reminded me of my beautiful trip to London - a year earlier.